Returns on stocks around the world have been muted since the turn of the century, in large part because we've seen two of the worst 5 bear markets in 90 years occur since 2000. Despite these setbacks, holding on through the downturns to the eventual recoveries has helped erase losses in a relatively short period, as the return matrix illustrates. The most important series of statistics in this table are listed in the bottom row. 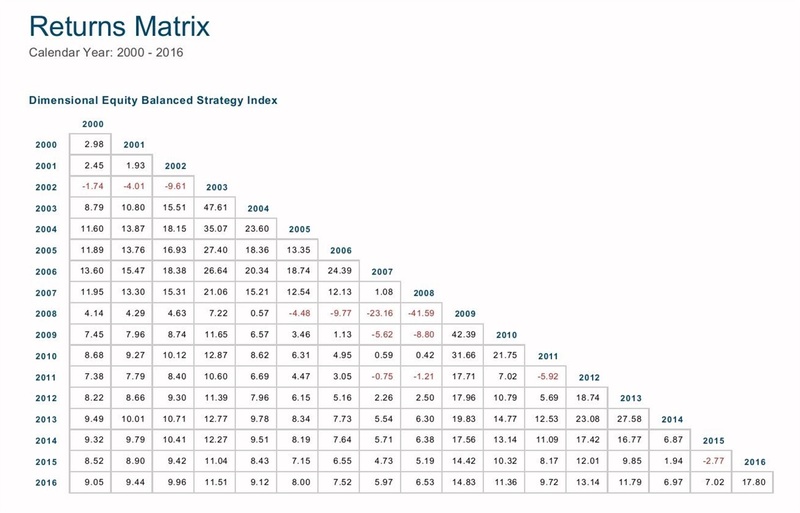 The figures show the annualized returns for a diversified stock index portfolio that is bought and held over every period through 2016, beginning as far back as 2000. Of course, some holding periods result in higher returns than others. But none of these outcomes are negative, nor are they so low that investors have been prevented from achieving reasonable financial goals if they diversified broadly and just stuck with their portfolio. Regardless of whether we experience a bull market or a bear market this year or next, I'm fairly confident that good things will come to those who wait patiently.